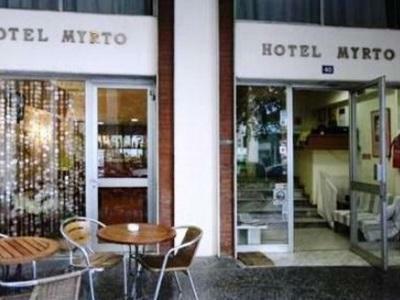 ﻿ Myrto Hotel Athens Athens. JIMAT di Agoda.com! Sesuai untuk berehat dan bersantai, Hotel Myrto terletak di area Plaka di Athens. Hanya 0.05 Km dari pusat bandar, lokasi strategik hotel memastikan tetamu boleh ke mana-mana sahaja dengan cepat dan mudah ke tempat-tempat tarikan. Juga terletak berdekatan adalah Muzium Yahudi, Galeri Zygos, Gereja Sotira Lykodimou. Menawarkan tetamu hotel perkhidmatan yang unggul dan pelbagai kemudahan, Hotel Myrto komited untuk memastikan penginapan anda berada di tahap seberapa selesa yang mungkin. Tetamu hotel boleh menikmati kemudahan seperti Wi-Fi percuma dalam semua bilik, daftar masuk/daftar keluar ekspres, simpanan bagasi, Wi-Fi di tempat awam, layanan bilik. Hotel Myrto mengandungi 11 bilik yang dihias indah dan menawarkan pendingin hawa, pemanas, telefon, televisyen, peti ais. Di samping itu, pihak hotel menawarkan aktiviti rekreasi untuk memastikan anda mempunyai perkara untuk dilakukan sepanjang penginapan anda. Apapun alasan anda untuk melawat Athens, Hotel Myrto adalah tempat yang sempurna untuk percutian yang menyeronokkan dan menarik. Anda mesti menunjukkan kad pengenalan bergambar serta kad kredit semasa mendaftar masuk. Harap maklum bahawa semua Permintaan Khas adalah tertakluk kepada ketersediaan dan bayaran tambahan mungkin dikenakan. Sila beritahu Myrto Hotel Athens terlebih dahulu mengenai anggaran waktu ketibaan anda. Anda boleh melakukan ini dengan menggunakan kotak Permintaan Khas semasa membuat tempahan. Anda juga boleh menghubungi tempat penginapan dengan maklumat hubungan yang telah tertera di pengesahan anda. Very good location. A small hotel but very good pricing. It is just walking distance to Plaka area, Acropolis and you can just walk to reach all the sights and attractions in Athens. You can reach the hotel by going to Syntagma Square by bus X95. When we arrived Athens, the bus X95 stopped one stop before our destination and we had to take the metro which is just one stop to Syntagma Square. Hotel is located just 5 mins walk from Syntagma Square. The second booking was even worse -- we had to wait an hour to check in. Have a look at our first review. This is just an unreliable hotel. If you expect on-time check in at 2pm, the lift to be working when you check in when you are supposed to stay in the 4th floor with 160 kilos of luggage (they offered no help and did not seem to care that we had 2 seniors with us), not sharing one key for 4 persons staying in the room, secure luggage storage in case you arrive early or have to check out before your flight or the wi-fi working; FORGET BOOKING THIS HOTEL. We went to 5 hotels in Europe during our trip and this is by far our worst hotel experience. Will never book again. There were police in the lobby at one time because someone called the police because the hotel refused giving to give them a refund after a really bad check-in experience. GO FIGURE! Really recommended to all tourist. Good location with cheap price. Room quite big and staff very nice too. Breakfast normal, but perfect for short stay. It would be nice if they provide hair dryer. super near the heart of acropolis and the city center. however it is a very simple simple inn and small round. This hotel is located in a great spot. Easy walking distance of the Acropolis. Great restaurants and shopping nearby. Only one small disappointment was that we were not allowed to check in earlier even though room seemed ready. It would have been a great plus after an overnight flight. Definitely would stay there again and will recommend it. The location is good. It is near to most of the attractions. Howoever, they don't provide the hair dryer in the room and the staff are not trying to help as well. I have asked 4 times for the hair dryer for 2days. First time , the receptionist said they will put it to our room when we went out, at the end , nothing. I asked for the second time, they said someone stole the hairdryer, they will try to get it from another room, nothing at the end. After the forth time , I still haven't gotten the hairdryer in two days . The hotel is about 10 minutes walk from Syntagma Station. The room is neat with a balcony and can see the parthenon. I took the small room, everything is okay and clean. Just there is a scent/smell of the room/air which rather uncomfortable to me. AC unit is just at the window behind bedrest, noose creeps through at night...slept without AC. We had a pleasant stay in this well-located hotel. not really clean and neat.and the lift is so small. location is good .but not easy to find the hotel. The staff was great,t the breakfaxt goodhey were very helpful and informative. Breakfasxt was good. The room was big enough but is was definitely run down and carpets needed some cleaning. Having said that the staff was super. Very helpful! Our view is that you don't spend that much time in the room. The bed was comfortable and the bathroom adequate. It was close to the Plaka and the Acropolis. Good value.